Been hosting a whole bunch of dinner parties and cooking up a storm with all the great summer ingredients available right now – sweet peppers, juicy corn, tomatoes – oh-the tomatoes…and many more. 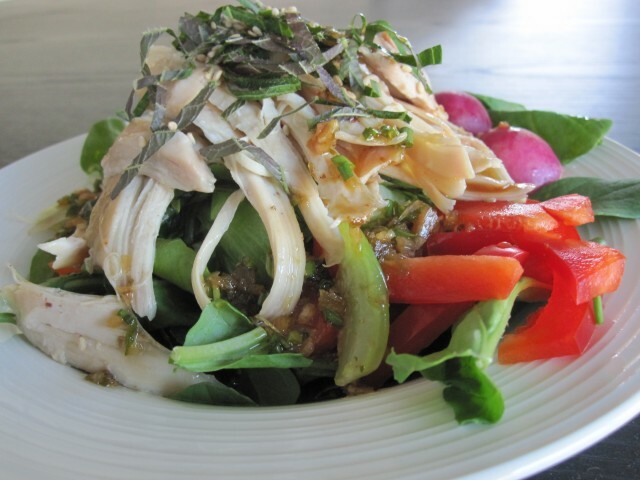 Or – whip a savory asian salad by spiking ponzu sauce to your lemon vinaigrette. Ponzu sauce – looks like a light soy sauce – available at most grocery stores – a mixture of soy sauce, mirin – a Japanese rice wine, yuzu/lemon juice and couple other umami-enhancing ingredients but usually no msg. Boil some baby bok choy (a variety of Chinese cabbage), steam some chicken breast (steam keeps it moist while draining the fat), slice up some vegetables (I used red bell pepper and cute little pink radish for this one, thinly sliced or “chiffonade” some Korean parilla leaves, drizzle the lemon vinaigrette/ponzu dressing and it’s good to go! If you feel like grilling, sizzle some Japanese eggplant cut lengthwise about ½ inch thick, salt/pepper it lightly and drizzle some grapeseed oil (has a higher smoke point than olive oil and lighter in flavor). Eggplant is a cooling vegetable that clears heat, low in calories and great meaty taste. Strip some sweet summer corn from the cob by breaking the cob in half and using your handy-dandy utility knife (the smaller one you use to cut apples, etc) carefully run it thru toward you – it sounds bit scary, huh? Use caution and practice – it really is easy. Sautee them on a non-stick pan, and when they start to become translucent, take them out and put it aside. Take some grapeseed oil, cut tofu into 1 inch cubes and grill them on the pan for ~ 6-7 min on each side. 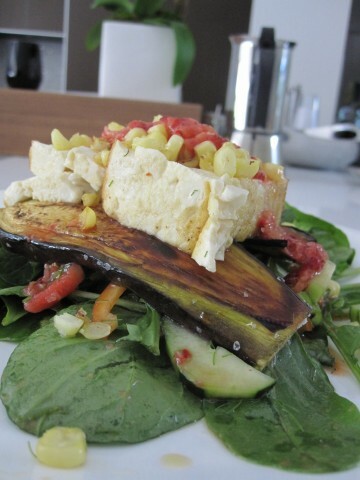 Assemble arugula (or any other greens), chopped veggies (like cucumber, tomato, etc), and top with the grilled tofu and corn, drizzled with dressing of your choice. I promise – you won’t miss the meat and will get your protein fix from the tofu. 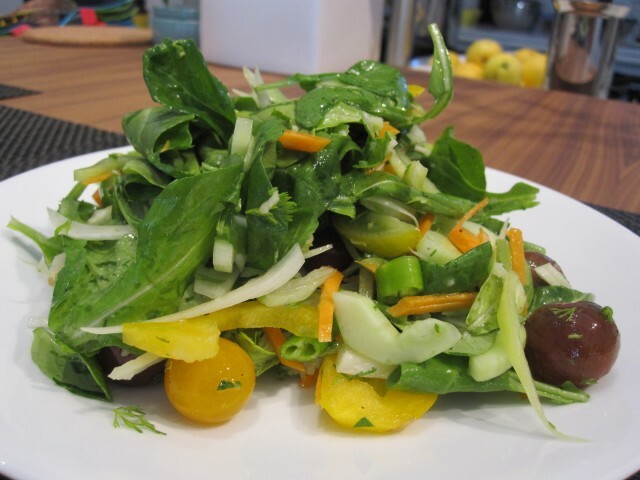 This entry was posted in becoming a chef, Chef Kelly and tagged asian salad, eggplant, lemon vinaigrette, salad, summer salad, sweet corn, tofu. Bookmark the permalink. mmmm – looks good~ What a refreshing idea!